It is Monday and I'm coming off a very relaxing weekend. Thanks to the weather, we spent a few hours at the mall on Saturday and my son's first baseball game, which was scheduled for Sunday, was cancelled. NJ weather has been a bit crazy lately....tornadoes!! Really???? I've lived in Jersey for 27 years & I've NEVER seen a tornado warning! LOL, fortunately we didn't see anything and didn't even experience a bad storm so it was all ok! Now its back to business.....I have several things on the calendar for this week but I will start with our meals!! 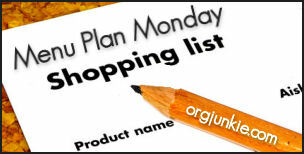 So this is it, I have to write up my shopping list to have all my ingredients available for the week!